The San Diego Chargers beat the Houston Oilers 30-27, in a home game at San Diego Stadium on October 17, 1976. The game proved to be inconsequential, as the Chargers went 6-8 for the season and finished out of the postseason race. However, the halftime festivities that day featured the inaugural induction class of the San Diego Chargers Hall of Fame. Four former players, men from the great days of the AFL, were posthumously inducted into the newly-minted team hall of fame, and memorialized as great contributors to the earliest of Chargers teams. 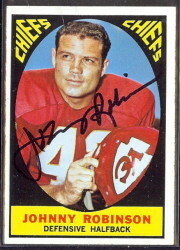 FRANK BUNCOM was drafted by the Chargers in the sixth round (48th overall) of the 1962 AFL draft. A linebacker at USC, Buncom immediately fit into San Diego’s linebacking corps that already included Paul Maguire, Emil Karas, Chuck Allen and Maury Schleicher. 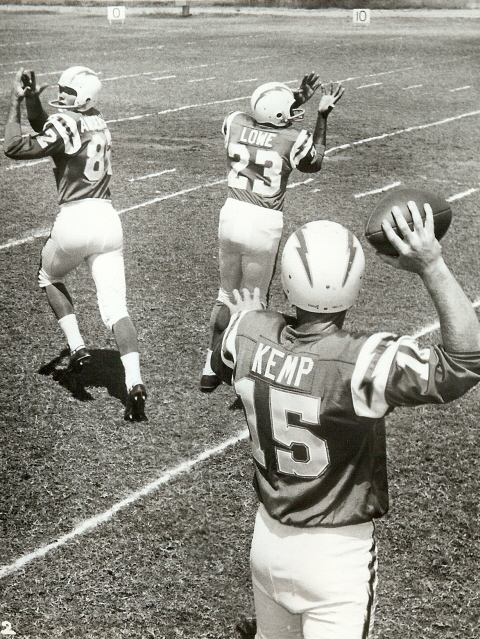 He was a quiet man who earned the respect of his teammates as being an honorable guy, and a solid player who, as teammate Bob Petrich put it, “hit like a mule on the field.” Buncom played on three AFL All-Star teams, and was a member of the Chargers 1963 AFL championship team. 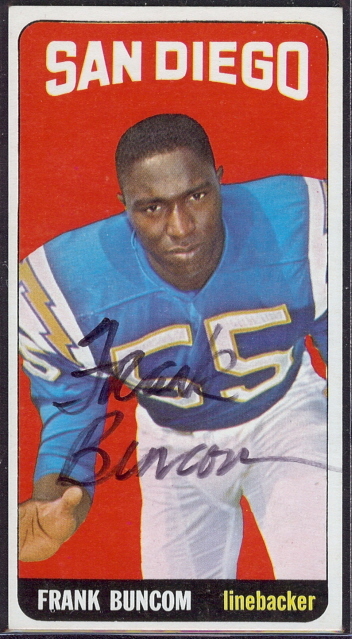 The Chargers lost Frank Buncom to the Cincinnati Bengals in the 1968 expansion draft. Buncom played in 1968, and was set for the 1969 season when he unexpectedly died in his sleep on September 14, 1969, the night after their season opener against the Miami Dolphins. 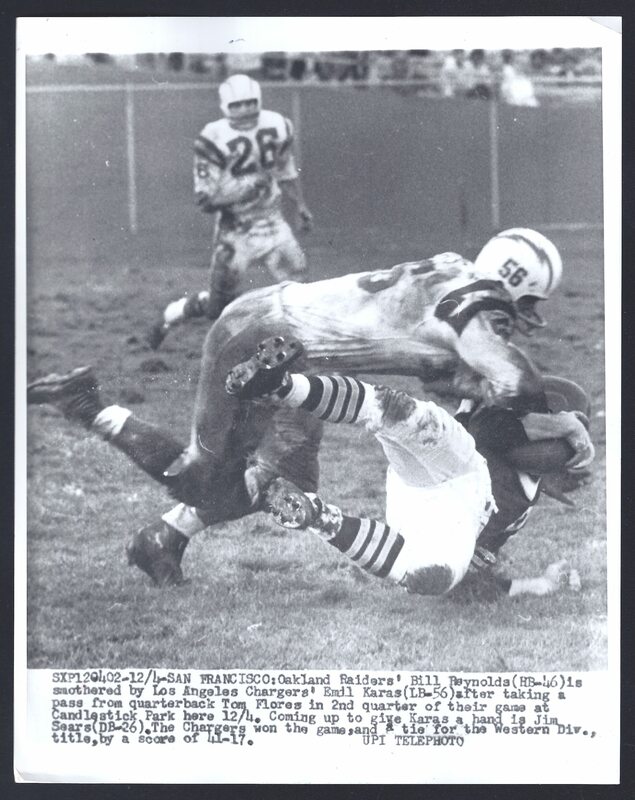 EMIL KARAS came to the Los Angeles Chargers in 1960, after playing for the Washington Redskins in the NFL the year before. The Dayton linebacker moved to San Diego with the team in 1961, and became a fixture on the Chargers defense. 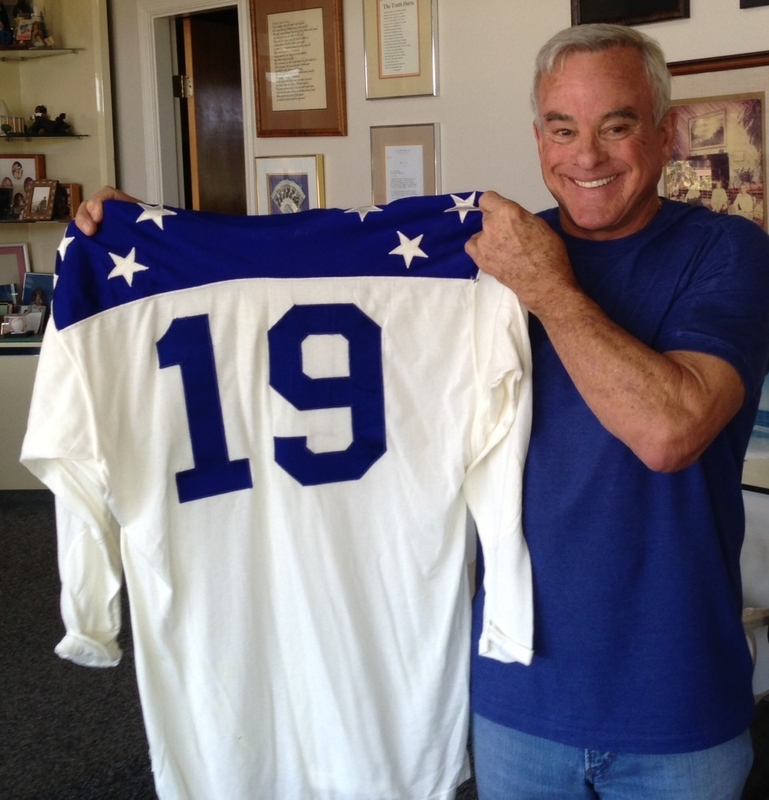 He was a member of the Chargers “Seven Bandits,” the defensive backfield that set a league record by notching 49 interceptions in 1961. 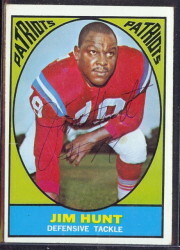 Karas was a three-time AFL All-Star, and member of the 1963 championship team. 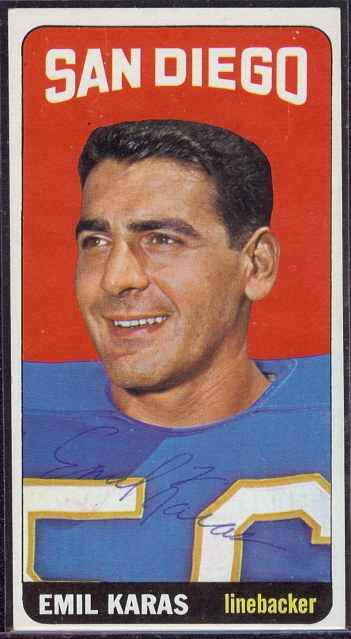 After his playing career ended, Emil Karas maintained his ties with the Chargers by working in the Chargers front offices. He began as a Ticket Promotions Director, and worked his way into the media. Karas was working on the radio broadcast team during Chargers games when he was diagnosed with stomach cancer. He passed away on November 25, 1974, at the age of 40. BOB LARABA was a linebacker and reserve quarterback from Texas Western. He was also used at punter. He came to the Chargers in 1960, and backed up Jack Kemp at quarterback, while playing regularly on defense and special teams. 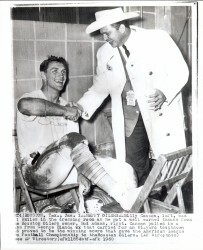 Laraba played the 1961 season in San Diego. Bob Laraba died on February 16, 1962, the victim on a car accident in San Diego’s Pacific Beach region. JACQUE MAC KINNON was “Mr. Irrelevant” of the 1961 NFL draft, the last player selected overall. He was drafted second-to-last by the Chargers in the AFL draft, and signed with San Diego. He played a variety of positions (tackle, guard, fullback) before finding regular playing time at end and becoming an important part of head coach Sid Gillman’s offense. 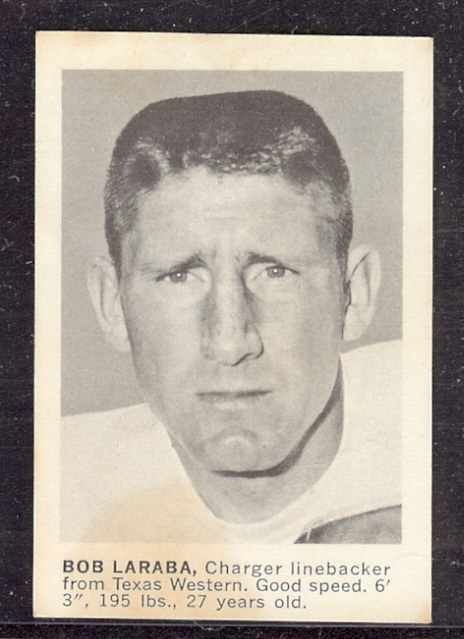 MacKinnon was an AFL All-Star in 1966 & 1968, thus becoming the only “Mr. Irrelevant” in pro football history to become an all-star. Jacque MacKinnon was out of football when he died in 1975. He had leapt a tall fence, not knowing about the construction site on the other side. MacKinnon fell some 30 feet and died of injuries caused by the fall. Ralph Anderson (left), Paul Lowe and Jack Kemp. One curiosity of the Chargers Hall of Fame is the omission of Ralph Anderson, a flanker for the Los Angeles Chargers, who died of a diabetic seizure in the midst of the 1960 season. If the inaugural class of the Chargers Hall of Fame was to recognize those players that passed prematurely, then why not include Anderson? It is possible that his exclusion lies in the form of a technicality. 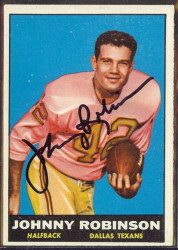 Anderson was only a Los Angeles Charger, while the formal name is listed as the San Diego Chargers Hall of Fame. I have never heard an explanation for Anderson’s omission. Frankly, not many people have ever heard of him, including members of the Chargers front office. 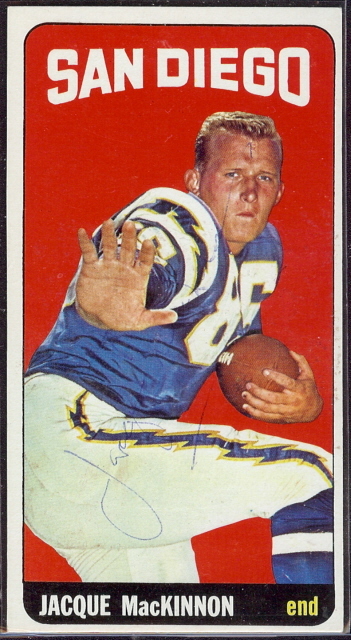 But it seems a disservice to one of the earliest of Chargers players. Many of pro football’s greatest names are members of the Chargers Hall of Fame. Buncom, Karas, Laraba and MacKinnon may not be as well known as Lance Alworth, Dan Fouts, Sid Gillman and Don Coryell, but they were valuable members of their teams, and loved by their teammates. It is a fitting honor that these men, whose lives were cut short, are recognized in perpetuity for their contributions to the game.